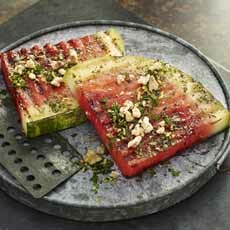  Grilled watermelon steaks with walnut gremolata (photo courtesy McCormick). 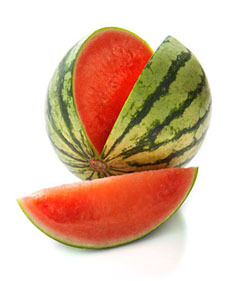 Use seedless watermelon (photo courtesy Bridges Produce). We’ve previously recommended cauliflower steaks and grilled cabbage steaks. Today’s “field meat” steaks are made with watermelon. The sweet fruit is grilled with savory seasonings to create a special first course. Seedless watermelon is cut into thick “steaks”; marinated in a mixture of white balsamic vinegar, lemon juice and rosemary; and topped with a walnut gremolata. What’s gremolata? It’s a lively, fresh-chopped condiment that typically includes parsley and/or other green herbs, plus lemon zest and garlic. It’s the traditional accompaniment to osso bucco, braised veal shank; but it’s a tasty accent to many dishes. Bonus: Because it’s so flavorful, you can cut back on salt. Here’s more about gremolata, including the classic gremolata recipe. Prep time is 10 minutes, cook time is 8 minutes. Some people like to cut the watermelon into rectangles, in line with the steak theme. You also can cut the grilled watermelon into bite-size squares and serve them as hors d’oeuvres. 1. CUT four 1-inch-thick, half-moon slices of watermelon. Reserve any remaining watermelon for another use. 3. MAKE the walnut gremolata: Mix the walnuts, parsley and lemon peel in a small bowl and set aside. Remove the steaks from the marinade, reserving the leftover marinade for basting the watermelon during grilling. 4. GRILL the steaks over high heat for 2 to 4 minutes per side or until grill marks appear, brushing with the leftover marinade after the 2-minute mark. 5. SERVE: Cut the watermelon steaks in half. Drizzle with the reserved marinade. Sprinkle with the gremolata. WHICH IS BETTER: SEEDLESS OR SEEDED WATERMELON? There’s really no difference between seedless and seeded watermelon when it comes to taste. Most people prefer not having to deal with seeds, as opposed to those who enjoy seed-spitting contests. A watermelon’s flavor is impacted by different factors, and seeds aren’t really one of them. Flavor can be greatly influenced by seed variety, the time of year the fruit was harvested, the amount of rain the crop received, the general climate it was grown in, how much direct sunlight it got, the type of soil, and other variables. All watermelon grown for retail sale must meet a minimum brix level, a measurement of sweetness. Most watermelons exceed that level.